Nkful Thursday. I’m grateful that a Massdrop parcel arrived AND that I won a giveaway through the Sew Mama Sew giveaway day :)) a great day! What a wonderful idea for a link up, Yvonne!! And thanks for being a mentor for this years new bloggers!! I”m so excited for our next new quilt blogger adventure 🙂 I so desperately need a rainy day, one on a weekend would be preferable. I got so much done this winter that since my snow has melted it’s been a struggle to get into the sewing room since I’d rather be in the sunshine! I am thankful for your initiative in getting the whole new blogger hop up and running. You are doing an amazing job! That is the sweetest picture of puppy. He is very photogenic! Oh my goodness… snow? Do you even get snow in wintertime? 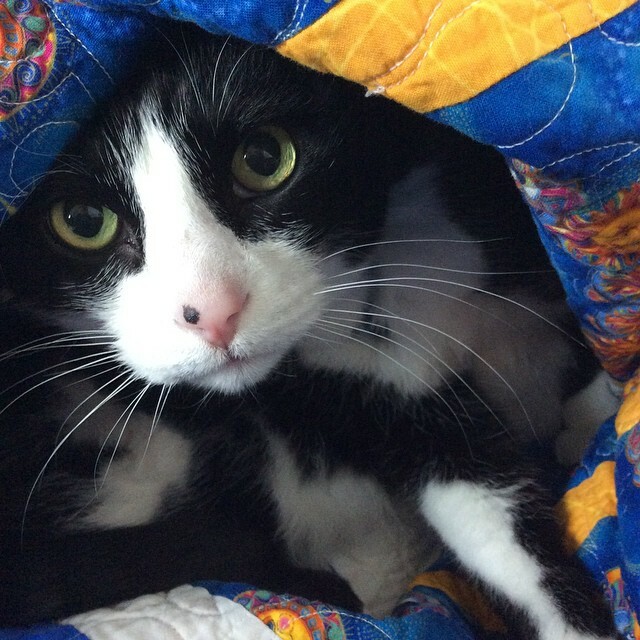 What a great thing to do for new quilt bloggers Yvonne! It isn’t easy to learn the ropes and it is really kind of you and the others to reach out like that. I’m thinking I might join in. It is coming up on 11 months of blogging now for me. I figured out things as I went along, but there is so much more I’d like to learn. So this week I don’t have a post, but I am thankful nonetheless. Thankful for my daughter’s upcoming graduation. And thankful for my two dogs who are great companions. I think it’s great that the blog hop will continue. So sweet of your group. Today I am thankful for getting more fabric to finish a secret project. And Monkey is grateful for the picture of your cat. He keeps asking to see it and then laughing. You’re going to be an awesome mentor!! I’ll definitely be back on Monday to learn more about how to help out! After a few weeks of rain and hot temps we are getting milder weather and sunshine and I’m grateful for that. The blog hop last year was a godsend to me and I think it’s great your group is keeping it going. I will definitely help in any way! Sounds like a great idea for carrying on the blog hop. I’m feeling very happy with sewing right now, lots of ideas I’m enjoying, more time would be good (as always!) but little bits are being squeezed in here, there and everywhere so sewing life is good! And today I’m extremely thankful for sunshine not rain, since I’m off camping in the woods with the boys shortly.